From April 17, 2019, any new classes created in Google Classroom will experience new ordering rules on the Classwork page. New topics or items posted to the Classwork page in these new classes will start to appear at the top of the page instead of the bottom. Google has made this change to improve the user experience of Classroom based on teacher feedback. This feature will not be supported by versions of the mobile app which are older than 2.2019.06301 on iOS and 5.2.102.04xx on Android. What does this mean for me and my students? Users running mobile versions of the Classroom app older than the above-mentioned versions will not see the order they set on Classroom web for their Classwork pages in new classes within the mobile apps. Additionally, assignments posted via these older mobile app versions, will not post to the top of the page. To enable you and your students view the new ordering on mobile, please update your devices (via the Play and App Stores) so that they are running the latest versions of the Android and iOS apps. Google Classroom is designed to help teachers create and collect assignments paperlessly, including time-saving features like the ability to automatically make a copy of a Google Document for each student. It also creates Drive folders for each assignment and for each student to help keep everyone organized. Students can keep track of what's due on the Assignments page and begin working with just a click. Teachers can quickly see who has or hasn't completed the work, and provide direct, real-time feedback and grades right in Classroom. They can also create secure quizzes using Google Forms. Our district targets Google Classroom for elementary school teachers and Canvas for secondary school teachers. The district encourages elementary school teachers to explore using Google Classroom, and it can be used by any district teacher upon request. 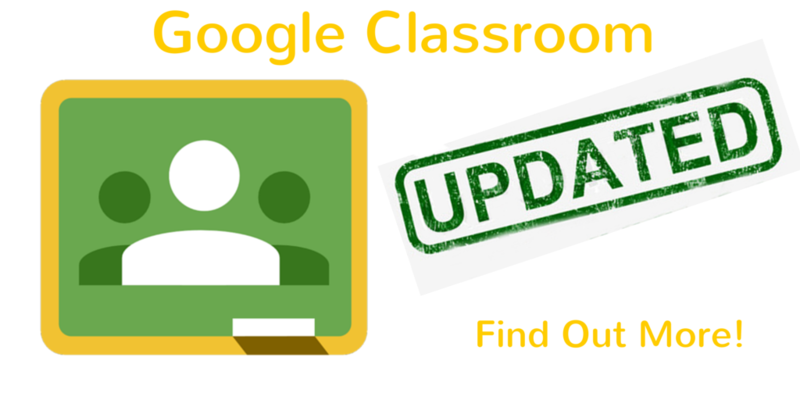 See the district's Google Classroom page for instructions. However, the district urges secondary school teachers to explore using the more powerful Canvas LMS, which includes the ability to export grades to PowerTeacher Pro and is licensed for use across grades 6-12. Teachers can use this Google Slides* add-on to allow students to open a presentation on their Chromebook and individually respond to on-screen questions. Teachers can use this for formative assessments for bell ringers, checks for understanding, exit tickets, etc. The free version allows you to use the add-on, project anonymized student responses, lock slides when presenting, and more. If you use videos, animations, or GIFs in your presentation, be sure you install the free Pear Deck Power-up extension on your staff Chromebook or your desktop Chrome browser to improve performance. You can get a 30-day free trial of the Premium version, which adds a teacher dashboard you can on your Chromebook while your desktop runs the show, draggable and drawing student response slides, more control over responses display, and takeaways for students. However, the Premium version is $150/year for a teacher to purchase individually. If a significant number of teachers would make regular use of the Premium features, the district would consider purchasing premium access for a school site. *You can import PowerPoints into Google Slides so you can use them with Pear Deck. Here are three useful websites that provide easy-to-use tools for managing the classroom using your projector screen, wall monitor, or Promethean Board or for recording your lessons or online demonstrations. We've already have a dozen or more teachers and over 100 students using Screencastify. It is a Chrome extension teachers or students can install on their Chromebooks so they can record their screens and/or record using their Chromebooks' built-in webcam. Some teachers use Screencastify for flipped video lessons where they provide the lesson as a video they embed in Canvas or Google Classroom for their students to view outside of class. All district students and staff have free access to Screencastify Premium through June 30, 2019 by logging into the service with their district Google account. The free version allows you to record up to 50 videos, each up to 10 minutes in length, which will have a Screencastify watermark. The Premium version removes the length and quantity limits as well as the watermark, while adding online trimming and merging as well as exporting. The district will be purchasing a limited number of Premium accounts for teachers in 2019-20. So try out Screencastify and, if you wind up needing the Premium features for your class, let Granger Meador know you're interested in Premium access. In grades 6-12, a teacher can insert the link into his or her Canvas course in its Announcements, Assignments, Events, Discussions, or Pages for students to use. 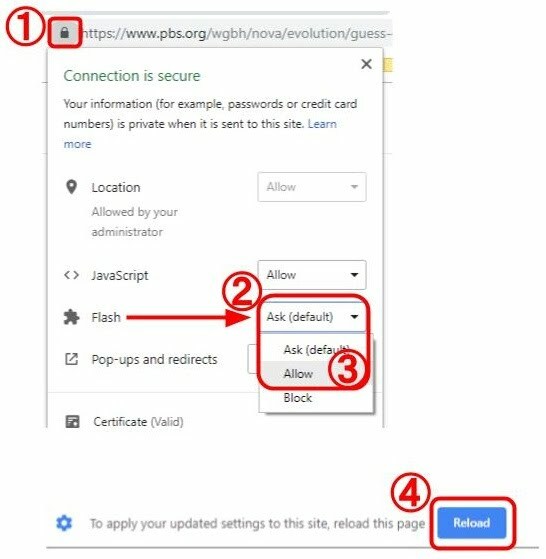 If you have set up Google Classroom, use it to share the link with your students, such as installing and using the Chrome extension that enables Share a webpage with your class. You can use the Pear Deck Add-on for Google Slides to allow students to view your slideshow on their devices and click a link you add to a slide using the add-on. If you like Flippity, you can install its Add-on to Google Sheets so you can quickly invoke it within Google Sheets from the Add-ons menu. Skip the spreadsheet: If you're in a hurry, you can just quickly type things in and use some of the features without using a Google Sheet. Here are some enhancements available for your district Gmail account. They address various issues staff members have identified. These enhancements have been added to the appropriate sections of the district's Using Gmail manual. Installing this extension in your Google Chrome browser will make Gmail your default email application when using Chrome and provides a button in Chrome to compose a Gmail message to quickly share a link or the current URL via email. This extension will open a Compose window in Gmail when you click any email address on a webpage. 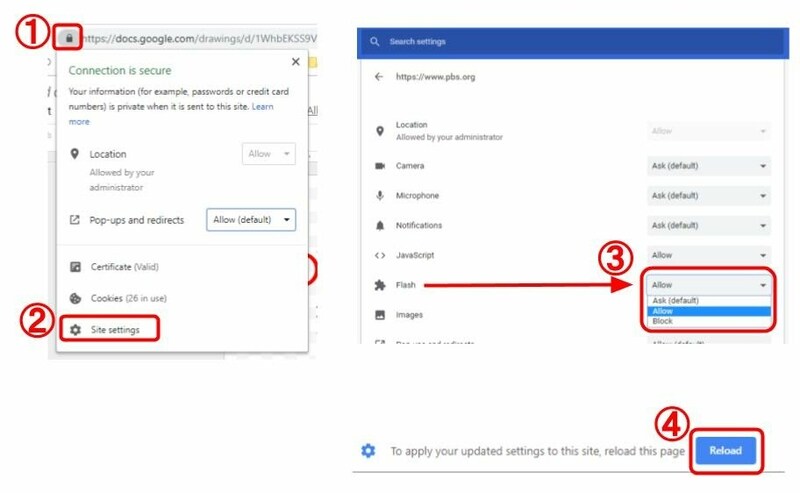 It also provides a button in the extension icons to the right of the address bar that will create a Gmail message when clicked, using the page title as the subject and selected page text and link address (or the address of the current webpage if nothing is selected) as the message. Some people like Gmail's Conversation view, where it groups related messages, but dislike its default order of displaying the messages from oldest to newest. 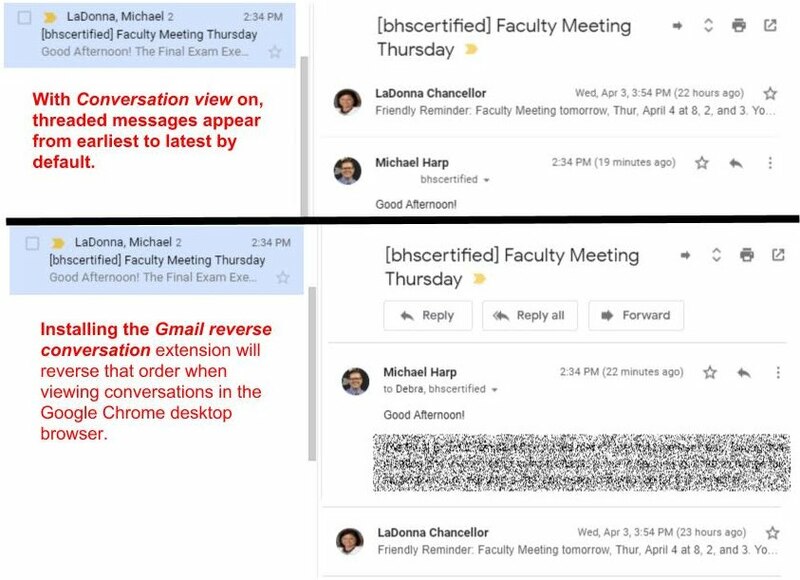 The Gmail reverse conversation extension can reverse that order in a desktop browser so that new messages are at the top. This feature should be enabled in our domain sometime after April 15. Once this feature debuts, you will be able to schedule an email you compose to be sent at a later date and time. This will help respect co-workers' normal working hours, disguise when you have a late-night brainstorm, etc. The feature will let you choose from suggested send times, such as "Tomorrow morning" at 8 a.m. or "Tomorrow afternoon" at 2 p.m. Or you can schedule a specific date and time. To use the feature once it becomes available, click the ▼next to the blue Send button to get a "Schedule send" pop-up box with various default options and one to pick a date & time. 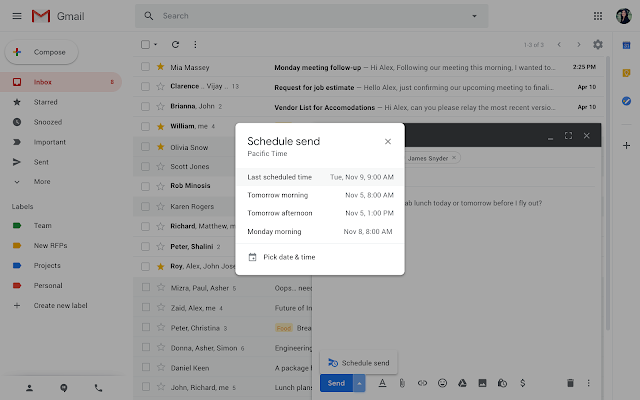 You will also see a new Scheduled folder/label in the left-side navigation which will hold the queued emails to be sent. Please note that the new folder/label could appear in our systems before the feature actually is enabled. A year ago Gmail added the ability to "snooze" messages. You can click on the icon when you hover a message's entry in your Inbox to have the message temporarily removed from your Inbox and choose a day/time for it to reappear. Some Google Form surveys are restricted to district users, meaning you must be logged into your district Google account to access them. If you use Google apps through work or school, make sure you’re signed in to the correct account. When someone makes a form through work or school, only people in their organization can see the form. Unless they change that setting, these forms can’t be viewed from a personal Gmail account. At the top right, click your photo. If you don't see a photo, you might see the Account image . Input your district email address as the username, which has the format username@bps-ok.org. After you sign in, try the link to the form again. Why must I sign in? will require that you login even if you remain anonymous. How can I tell if my responses are anonymous? For those students and parents for whom English is not their native language, Google Translate is a great online service for translating web pages from one language to another. 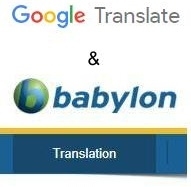 We include a Translate link on our websites to facilitate use of the service. Unfortunately, the way Google Translate recreates a webpage in a different language also makes it a security threat on campus that could be used to bypass the web filter required by the federal Child Internet Protection Act. So Google Translate is blocked for students when they are on campus. We continue to encourage students and parents to use Google Translate when off campus. If you encounter a website with videos, animations, or other interactive elements that will not load or run properly, they may rely on Adobe's outdated Flash player. Adobe has stopped supporting Flash, and Chrome will stop all support for Flash in 2020. Until then, Google is making it more difficult to run Flash in an effort to convince websites to update to newer code like HTML5. Click the padlock icon to the LEFT of the webpage URL in the browser. If the pop-up menu has an entry for Flash, select it. If there is no such entry, click on Site settings. Change the setting for Flash to Allow. When you return to the webpage, you may be prompted to Reload it. You can record a presentation as a video using Screencastify on your Chromebook or desktop computer. 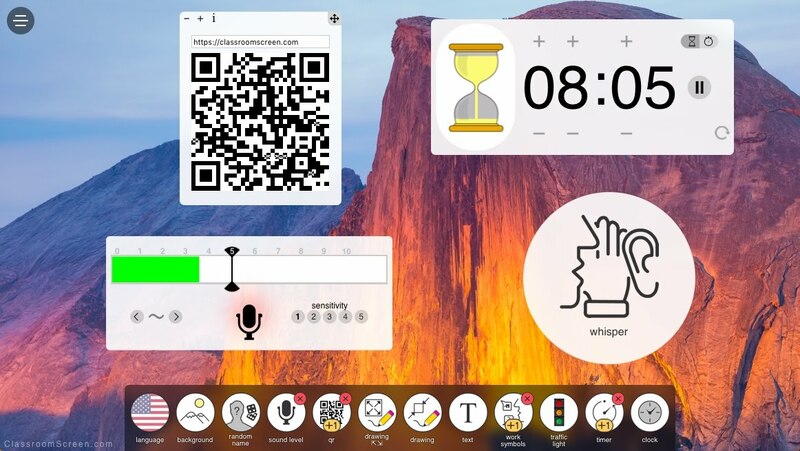 6-12 teachers can use the microphone headset they earn via Kung Fu Canvas with a Windows computer or Chromebook. Do you often find that kids in the back of classroom don't pay as much attention? Do you often repeat yourself during instruction? Want to make a recorded presentation more useful to students? You can use your Chromebook's built-in microphone to caption your comments during a Google Slides presentation in real-time. Click the Present button in a Google Slides presentation. While presenting, navigate to the floating toolbar at the bottom of the screen. Click the Captions icon. Your microphone will pick up anything you say and display your words at the bottom of the screen. Over Thanksgiving Break the district's Technology Services department will be working with Tel-Star Communications to finish the configuration of the new phone system. The planned "go live" date when the old phones should stop working and you should begin using the new handsets is Monday, November 26, 2018. Please keep both the new and old handsets until the new system is actually live and working. If all goes well and your new phone is working properly on Monday, 11/26 for both in-district and outside calls, please disconnect the old phone cord from its wall plug, wrap it around the old handset, and take the handset to the library at each school site (or the receptionist at operations sites) to be checked in against a listing of extensions. Tel-Star bought back all of the old handsets as part of their contract. A detailed manual and instructional videos of various lengths about the new phones have been posted via the Telephones link at BPSDTECH.ORG. By Monday, 11/26 your new phone should already be in place and connected. If it is NOT connected, see the Cords and cables section of the new manual for assistance or the online video. If you have an extension number yet still don't have a new phone by 11/26, inform your site's lead secretary. Faxing is an obsolete technology, so we strongly encourage you to shift to using email instead whenever possible. If you simply must send a fax, please use the new online fax server instead of the old fax machines, since using them will be tying up old-style phone lines intended only for emergency use. Incoming faxes will arrive as email attachments to designated folks at each site, who will be responsible for forwarding those fax emails to the intended recipients. See the Fax server section of the new manual for details on sending or receiving facsimiles. 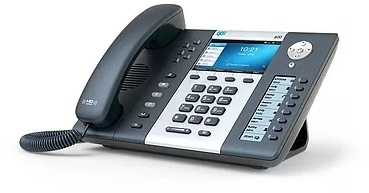 If you encounter difficulties with the new system, please first check out the manual and instructional videos at the Telephones link at BPSDTECH.ORG. Site secretaries will be a good resource, and they can help get answers and assistance from Tel-Star and Technology Services folks who will be available as the new system deploys. After the initial deployment, assistance can be obtained via the usual Technology Help Desk procedure.